They focus on minutes. Productive people don’t break their day into hour or half-hour increments. Instead, they realize that every minute matters, and they don’t waste a single one. They do one thing at a time. Productive people decide what is their most important task, and then they work on that task – and only on that task – for the first hour or two of the day, when they know they have the most energy and attention. They don’t use written task lists. Since research shows that many things on the average person’s to-do list never get done, productive people don’t use those lists. Instead, they use a scheduler and write down not just what they are going to do, but when they are going to do it. They recognize that plans often don’t happen. How often have you bought a gym membership but never used it, or bought a self-help book and never read it? Productive people understand that everyone sabotages themself in that way. They know how they specifically self-sabotage, and they work to avoid it. They don’t just work. Productive people know that things like being with family, getting exercise and volunteering in the community help to recharge the batteries. They put those activities on their schedule – and they do them. They carry a notebook. Productive people realize that a great idea can strike at any time, so they are prepared with a notebook so they can write thoughts and ideas down before they forget. They don’t check email constantly. They schedule time to check their email, rather than checking every time they get a notification. That way they can focus on the emails that are important, rather than wasting time checking emails that don’t matter. They avoid meetings. Productive people realize that most meetings are a serious waste of time. Meetings usually start late, run long, and don’t include the right people. So while they can’t avoid all meetings, they try to limit and control those that they do attend. They know how to say no. Many people think that saying yes to most things will help advance their careers. But productive people know that there are only so many minutes in the day, and so they choose to spend those minutes on only a few things that really matter. They know that Pareto Principle, which says that 80 percent of results come from 20 percent of activities. Productive people know what those 20 percent of activities are, and they concentrate on those. They delegate. They don’t spend too much of their time trying to do everything themselves. Instead, they determine what they personally need to oversee, and they delegate everything else. They bundle tasks. As much as possible, they move all similar tasks to the same day. For example, they might schedule all their meetings for one day. They deal with things right away. For example, they answer most emails when they open them. They have a morning routine. These routines often include breakfast, exercise, and meditation or another form of feeding the mind. They conserve and increase energy. They realize that going flat out all the time saps energy and ultimately makes them less productive. 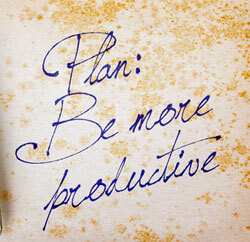 Productive people make sure they eat right, get sufficient sleep and take breaks.